The reaction stirred tank is an indispensable equipment in the chemical industry. It is suitable for stirring and mixing of different materials such as medical, pesticide, food, lotion, daily necessities, cosmetics, chemical, shampoo, bath liquid and other mucus, is the ideal equipment for daily chemical industry. 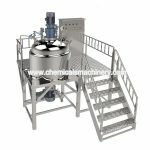 Stirring system using one-way or two-way wall scraped mixing and frequency control, suitable for different production requirements of the process. According to the technical requirements of heating or cooling materials, heating methods can be selected steam or electric heating according to customer requirements. The material uses SUS304 or US316L stainless steel, tank and pipe with mirror polishing.